Oh my gosh! I hate this place - 歌舞伎町 (Kabukicho). 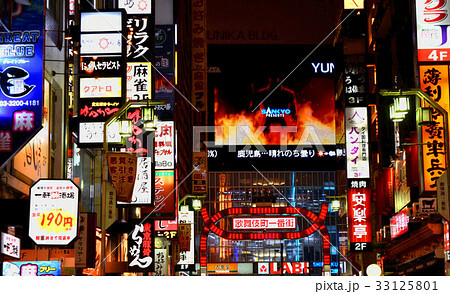 It's infamous for its red light district and is one of the most dangerous places in Japan. However this place full of desires fascinates many people and draws them in every day, every night. Everything there looks cheap and tacky. Nothing there can be beautiful. and beautiful saw it, they would be too shocked to say a word. But I myself am sometimes strongly fascinated by these places where chaotic and disorganized, or to put it another way, these ugly and not posh places and they arouse my curiosity. Though at the same time, I hate them in spite of this. One day I remembered a word 憎愛 (zouai) which consists of the characters 憎 (hatred) and 愛 (love). It shows literally the feelings of hatred combined with love . It's because you love it, you hate it as well. Perhaps the mixture of conflicting feelings deepen my attachment. I feel the same thing for other places, persons and my country as well.